I hope that you and your families are enjoying the fall climate or the seasonal changes, and that you are being thankful for each day. We, myself and a few non-Native and Dineh, wish to tell you about a need of urgency that is taking place in the remote lands of Big Mountain. Also we wish to send this message on behalf of the few elders who have stood up against the U.S. - Peabody genocide policies for over 40 years. If you at least know what traditional means or what land-base resistance is, these last Dineh elders out here have had much impact on the modern world and modern indigenous activism. Now we are entering a new era, an era that they tried to resist because it would eventually exterminate their future outlook for traditions and land-base existence. health, and these former traditional warriors are still trying their best to stay on the lands they cherish and love. Most of the seasons they are alone and most of the time there's no visitation from family members because America's urban life has consumed those lives. The U.S. Indian Law and Peabody aggression however continues and making progress with daily police monitoring and intimidation as Peabody waits for the BIA's green light to expand. This is the frontline of the fossil fuel extraction and exports to generate more electricity and maximize corporate profits. Not to mention the continuous emissions of toxic greenhouse gas from the Navajo Generating Station, and while Gov. policies have distracted native activism to corporate headquarters, far from the frontlines. We don't stop this corporate and low-key militarized invasion, 450,000 acres of pristine Big Mountain lands will go under the industrialized poison fields, choking coal dust and endless web of roads cut for fracking development. The once Big Mountain traditional society will vanish and this is one of the last few traditional native strongholds left in the U.S. Right now, some elder resisters are wondering what happen to the national and global movements to defend mother earth and most of all, the lack of physical presence and support, out here? Bessie Begay of Mesquito Springs, Oct. 20th: "Where are the herders, the supporters that used to come out? Our situation has not change. Maybe they are out here somewhere? We don't hear about them..."
Instead, we wish to provide you with a guide and inform you that the tools are available out here to do the stopping with. WE NEED YOUR PHYSICAL PRESENCE OUT HERE, ASAP! WE don't ask for monies, just your good-spirited will to come out for a few days/weeks/months and immerse yourself into a cultural community under threat, and accept the daily challenges in supporting these native elders' existence. And yes, we are not asking for monies because we wish to maintain that human sovereignty, and not seek lawyers or travels to far off cities to protest. However, do provide your own resources to stay and if you wish to share your labor-healing of love and foods, that is welcome. 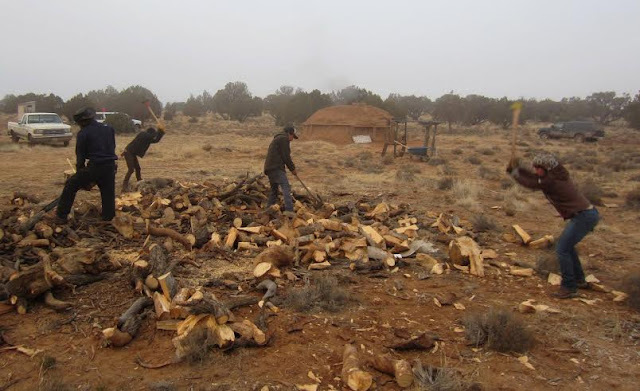 Seasonal Non-Native Sheepherders Collective: "The freedoms and autonomy that the indigenous inhabitants of Big Mountain area deserve are encroach upon everyday. Standing aside is not an option. Stand with native caretakers of Black Mesa, today!" Sheepherding is a difficult work, but if you enjoy hiking and are passionate about nature then, this can be another rewarding experience. Wood cutting and other manual help are always an ongoing tasks. Nothing is automated out here, but the lands hold much positive energy in its pristine state. Experience these native Dineh elders' livelihood and the many generations past of endurance within this set ecology. Perhaps, view this involvement as your future depend on it, survival and a bit of spiritual understanding. I hope that you will leave this great territory with those knowledgeable tools of resistance, empowering yourself toward natural survival, and tools for a much greater degree of resiliency. Also, this call especially goes out to native and Dineh youths. Actual occupation by us on our (Dineh-Hopi) ancestral homelands is key to making our sovereign, decolonized stand against these corporate industrial invasions. We have made endless speeches before the halls of the colonial empire, and should we continue the same paths for the next 20 years? - Attend the closing day assembly to feast and celebrate solidarity, Friday, November 27th. Lastly, climate change is upon us so be prepare for sudden inclement weather, have good shovels, proper clothing/gear or even tire chains. Contact the following list of information to coordinate your arrivals and departures, or any further questions. Remember, this is a remote Direction Action. We wish to thank you for your time, again. Ourselves and on behalf of the few traditional Dineh elder resisters, we hope to see you and hear from you soon. If i can raise the funds for a bus ticket from kentucky, i will come and help the elders. If i can raise some funds for a bus ticket, i would be honored to help the elders..where are all the people?? i don't understand...have so many gone the way of self-centered, selves? Big Mountain Fall 2015 Update Video (22 minutes), with elder resister Louise Goy, and Kat Bahe presenting.